Phew! Having quite loads of work these days, but totally loving it :D :D SO, I had used this shampoo long time back and just forgot to publish it! But then, yes, it is never to late! Dandruff is the most common problem we face during the winter months and we need to do proper hair care. So, does this Clear Shampoo deliver what it claims and is is a good shampoo for dandruff? Product Description- Clear Nourishing scalp care anti-dandruff nourishing shampoo complete active care GET UP TO 4X SOFTER HAIR^ NUTRIUM 10- Vitamins, Minerals, Nutrients. Healthy nourished scalp, beautiful hair. Scalp Fact- The scalp is the foundation of beautiful hair. That’s why we developed NUTRIUM 10, a deep nourishing formula that makes hair stronger^^, more beautiful^^. Directions for use: Apply to wet hair, massage into scalp, rinse. For best results, repeat the process and use every day. In case of contact with eyes, rinse with water and if irritation persists contact physician. 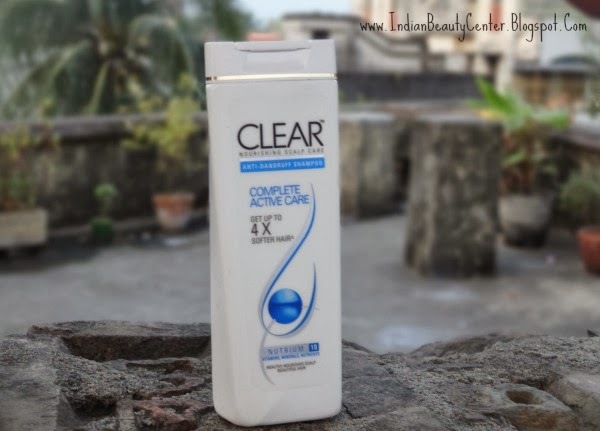 Clear Anti Dandruff Shampoo Ingredients- Water, Sodium Laureth sulfate, Cocamidopropyl Betaine, Dimethiconol, Propylene Glycol, Zinc Pyrithione, Dimethicone, Perfume, Sodium Chloride, Carbomer, Climbazole, DMDM Hydantoin, PPG-9, Guar Hydroxypropyltrimonium Chloride, Zinc Sulfate, Helianthus Annuus (Sunflower) Seed Oil, Glycerin, Panthenol, Lysine Hydrochloride, Tocopheryl Acetate, Methylsothiazolinone, Pyridoxine Hydrochloride, Sodium Ascorbyl Phosphate, TEA-Dodecylbenzenesulfonate, Citric Acid, Poloxamer 407, Laureth-23, Laureth-4, Sodium Benzoate, Sodium Benzoate, Sodium Polynapthalenesulfonate, PEG-9M, Xanthan Gum, Cellulose Gum, Aminometyl Propanol, Methylchloroisothiazolinone. 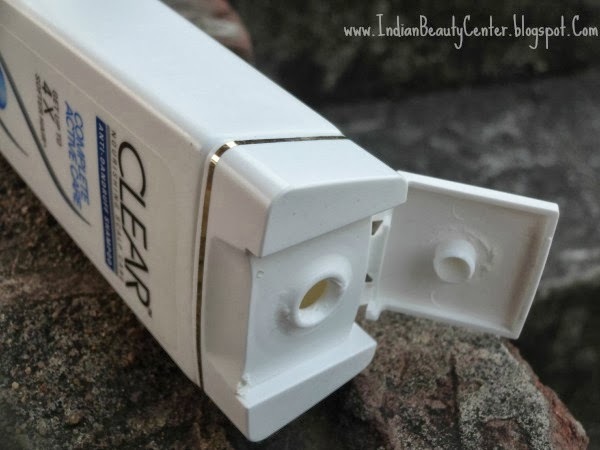 This shampoo comes in a white colored rectangular bottle, which looks cool but the flip-open cap is not so tight and I am always afraid of spillage. Anyhow, the shampoo comes in sachets too and is white in color with some glittery particles. The shampoo smells great, minty and fresh too! Almost all of us would like the fragrance that does not irritate the nose or feels overpowering. One problem is that the shampoo comes in a opaque bottle, so I can't really say that how much of the product is left behind :-/ The shampoo contains SLS and silicones too- very harmful for the hair. By now, you have read my post on Why use a silicone free shampoo and you know what kind of damages silicones cause to the hair, right? So, there goes a minus point for this shampoo. i have dry hair so i never use shampoo with dandruff control....as they make my hair more dry! I am so tired of using anti dandruff shampoos, most of them do not work or just have temporary effects. This sounds worth a try. But I still love the old kitchen beauty tip of using lemon juice for dandruff problems. Thank you for the advices and thank you for your lovely comment in my blog, I follow you now! Thank you dearie :D :D Yeah, this clear anti dandruff shampoo does make the hair dry and may cause damage in the long run! looks a decent product..iam using Pantene anti-dandruff...quite happy with that..
HI...good and thorough review. If this isn't the right shampoo for you, or you don't have this issue, we can help you find the RIGHT shampoo for you and your needs. Hey arpita...i hve very very dry hairs....nd i m stuck to ths shampoo frm my childhood...nd nw facing severe dryness....cn u suggest me some anothr shampoo tht hlp me in gettin rid frm ths dryness prblm ??? cn u suggest any othr plzz....?? I think you should try W2 Apple shampoo, I am using it and it does not make my hair very dry. It's affordable :) Also, if you face sever dryness, then go to the dermatologist otherwise you may suffer from severe hair loss. Don't even try this shampoo. I used it just once and my scalp and face started itching ,scalp went too dry and hair started to fall out from the first wash. Really hate this shampoo and the idiots who made that. 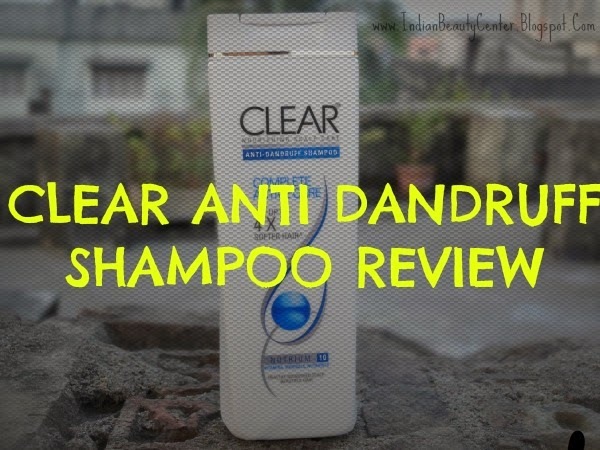 Clear Anti Dandruff Shampoo is a not fully chemical content good shampoo. Thank you For you post.